Nissan production in Sunderland. The automaker is reported to be planning job cuts. 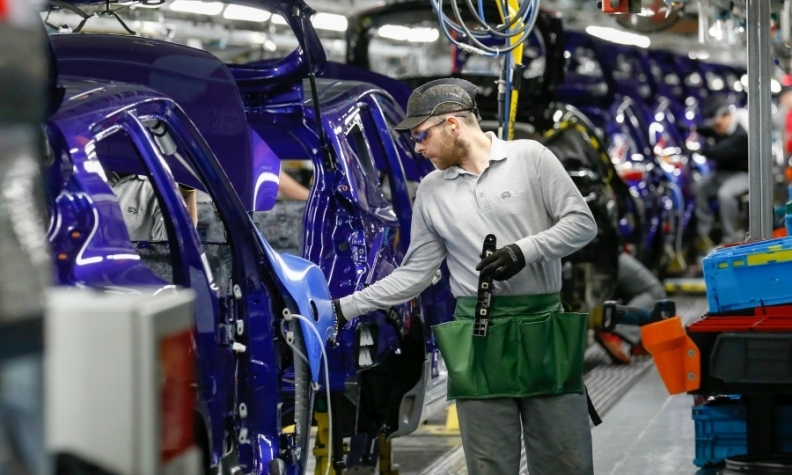 LONDON -- UK car production fell 13 percent in March as bad weather disrupted supply chains and worries over export prospects after Brexit and the future of diesel vehicles continued to dampen demand. Output last month dropped to 147,471, data from the Society of Motor Manufacturers and Traders (SMMT), showed on Thursday. Through March, production was down 6.3 percent to 440,426, the SMMT said. "A double-digit decline in car manufacturing is of considerable concern," Mike Hawes, CEO of the SMMT, said on Thursday. Four out of five cars built in Britain are exported. But the quarter's decline was led by a fall in production for the domestic market - which dropped by 14 percent - versus a smaller reduction of 4 percent in vehicles made for export. UK consumers' disposable income has been squeezed by a year of high inflation, triggered by the pound's fall after the Brexit vote in June 2016, and some have held off buying diesel cars due to concern about environmental damage and green taxes. "Following recent announcements on jobs cutbacks in the sector, it's vitally important that the industry and consumers receive greater certainty, both about future policies towards diesel and other low-emission technologies, and our post-Brexit trading relationships," Hawes said. In March demand for new diesel cars in Britain plunged by more than a third, pushing down total registrations for the month by 16 percent. Nissan and Jaguar Land Rover are both cutting jobs in the UK, according to industry sources who blamed a lack of domestic demand for diesel cars in particular. Thursday's figures add to signs that British economic growth is likely to show a slowdown when preliminary first-quarter gross domestic product figures are released on Friday. Last month, Prime Minister Theresa May reached an outline agreement with the European Union to preserve existing trade relationships until the end of 2020. But she has said that in the longer term she does not want a customs union with the EU, which automakers fear will disrupt their supply chains.